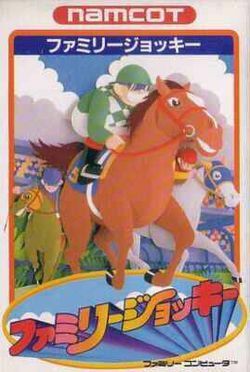 Family Jockey is a horse racing simulation developed and published by Namco for the Famicom in Japan in 1987. 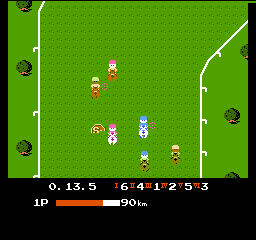 In the game, players take control of a horse, and help direct it to finish a track as quickly as possible by steering it, and wisely timing the expenditure of the horses energy in order to stay ahead of the pack without tiring too quickly. Progress is achieved by placing in the top four horses of each race. Prize money is earned by placing in the top three and by breaking course records. Namco developed a few remakes of the game. In 1991, they released a remake for the Game Boy, as well as a remake for the TurboGrafx-16 under the name World Jockey. 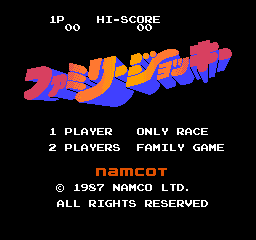 Namco also developed a sequel for the Game Boy version in 1993. In 2003, Namco published another a version for mobile cell phones, and in 2008, they revived the series by developing a version for the Wii. : Used the direction pad to steer the horse to the left or right. : Tap the A button to whip it an encourage it to speed up. : Press the B button to perform a jump when presented with obstacles. : Start a new game or pause he action mid-game. 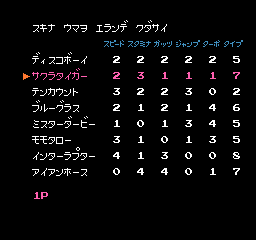 : Used to select from the four modes on the main menu. First, you choose the number of players, then you choose which mode of play you want. 1 Player: A single player game where the goal is to win as many races as possible. 2 Players: A two player game where both players compete to win as many races as possible. Only Race: A mode of play where players merely watch computer controlled horses races. 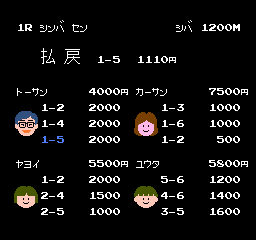 Family Game: A mode of play like "Only Race," however players are allowed to make bets on the race as well. Choose the number of players and whether you wish to bet or just race. 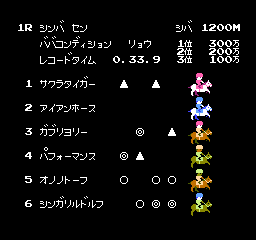 Eight horses are shown at a time. Press to switch between the two pages. You will see the six horses in the next race, along with four bookies predictions about who will win. A double circle is favored to win, a single circle is another good bet, and a triangle is a bad bet. [Family Game only] You have the option to enter up to three different bets for four people, a dad, mom, son, and daughter. You can only bet as much money as each person currently has, and each bet place will alter the odds for the next person. You will see the conditions for the next race track. Press to see your horse's current statistics as well. The race will begin, and you will control your horse throughout the race until the race is complete. If you are scrolled off the back of the screen, you are automatically retired. 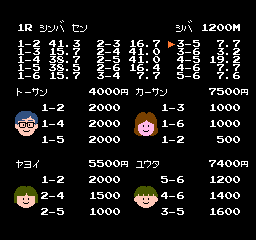 The race will conclude, and the results are shown. If you placed third or higher, you will receive prize money. If you placed fifth or below, you will be disqualified and the game will be over. Otherwise, the game continues on from step 3. [Family Game only] If you placed bets, you will now see the results of your betting. 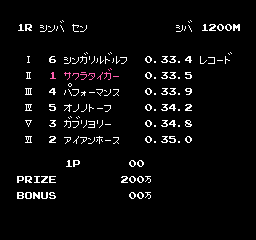 スピード Speed This number determines the highest maximum speed that the horse is able to achieve. スタミナ Stamina A horse with greater stamina can withstand running at a high speed for longer distances than a horse with low stamina. ガッツ Gutsy How gutsy a horse is determines how little strength it will lose when running in difficult conditions, such as rain, sand, or bumping into other horses. ジャンプ Jump Better jumping ability means a horse will have an easier time clearing obstacles that you attempt to jump over. ターボ Turbo Turbo dictates how quickly a horse will accelerate when it gets whipped by the jockey. タイプ Type A horse that has a high type value will be more likely to perform well under difficult track or race conditions. Note: 万 is 10,000. So 3000万 is 30,000,000 in prize money. On each race track, typically on the downward stretch of the track, a random assortment of power-up tiles will be present. 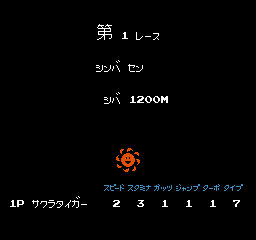 If your horse runs over the five circular tiles, that stat will increase by one point and the effects will be applied at the start of the next race. If your horse runs over the two energy tiles, the effects of that tile will be instantaneous. Horse with a high Type value start off with weak stats, while horses with a low Type value start off with better stats. However, you can improve every other attribute of your horse except its Type. Therefore, while you may have a tough time getting started in the beginning of the game with a horse that has a high Type, you will generally do much better near the end of the game with the same horse if you are diligent about collecting power-up tiles. Learn how to properly pace the whipping of your horse. If you whip too slowly, you will fall behind. If you whip too quickly, you will run out of energy before you cross the finish line. Hitting a horse from behind has the effect of slowing you down, and pushing that horse forward. Conversely, getting bumped from behind by another horse will give you a boost. If you lead the pack, you will be shown closer to the edge of the screen. This will take away from your ability to react to jumps or to move into position to pick up items. Don't lead by more than is necessary. Stay close to the inside lanes of the track, as this shortens the distance that you have to run. However, stay away from the muddy regions around the turns, as these slow you down. This page was last edited on 14 March 2012, at 00:12.